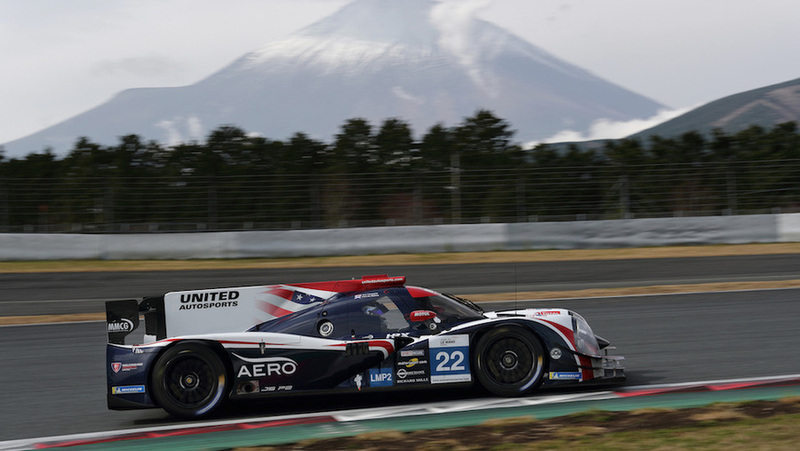 Phil Hanson, along with #22 United Autosports Ligier JS P2 co-driver Paul Di Resta, lead the Asian Le Mans Series after the 4 Hours of Fuji yesterday (9 Dec) – the Japanese race marking the mid-point of the four-race championship. A second consecutive second-place finish earns the British duo a three-point lead in the overall LMP2 rankings. The 4hr race around the 2.84-mile,16-turn Fuji Speedway began with moisture in the air and in a cold ambient temperature with rain falling approaching the end of the first hour. Phil, having earned himself his first career LMP2 pole and the team’s maiden series pole the previous day, started the #22 and lay second 30mins in, 7secs behind the leading #24. Hanson stopped (fuel+wet tyres) on 53mins but dramatically snatched the lead at Turn 1 on 58mins when #24 exited the pits having pitted a lap later. Phil impressively extended his lead to 19secs in the difficult, slippery conditions due to intermittent rain or drizzle before stopping for fuel on 109mins having had its lead dramatically reduced moments earlier when he was pushed wide and off the track by a slower car, fortunately without contact. The #22 remaining first and its lead was extended to 103secs with 95mins remaining when the second-placed #24 pitted for slicks as the track dried. But Phil was powerless to follow suit due to the regulated 90mins driving time of co-driver Di Resta for another crucial seven minutes, handing over the car after a 2hr 30mins stint, for fuel/slicks with 88mins to run. Di Resta lay 20secs down on the leading #24 with an hour remaining, the Scot re-taking the lead when #24 pitted (fuel) with 45mins to run. With 37mins remaining, Di Resta dived into the pits for a timed fuel fill under a Safety Car phase, #22 directly behind the leading #24 with 26mins left as the race resumed. But Di Resta was unable to challenge for the win in the closing stages taking second place at the chequered flag - a repeat of the car's opening Shanghai race result. Phil reflected: “The race was messy as we all expected a dry race. It was really, really cold making it difficult to keep any temperature in the tyres while the damp moisture in the air turned from drizzle to rain near the end of the first hour. I lost out at the start, dropping to second, but got the lead when it turned wet and made a good gap as my pace was good. But we were ultimately caught out by the allowed driving time. Meanwhile Paul added: “Second is not the result we’d hoped for especially after Phil had led so much of the race. We lost out when the #24 pitted for slicks and Phil had to wait until there was 90mins remaining for me to get in due to the regulations. Richard Dean, Team Owner and Managing Director, United Autosports, remarked: “There is everything to play for in terms of the championships going into the second half of the season which is very pleasing. Phil has been mega in the #22 from Friday morning but he and Paul were unlucky not to earn us our first Asian LMS overall win today. Phil was magnificent in getting us our first pole, drove stunning stints to lead the race in extremely difficult conditions, but our strategy options are limited with a two-driver line-up of a platinum [Di Resta] and silver [Hanson] FIA rated drivers with Paul only able to run a maximum of 90mins in the car. This contributed to the fact that we couldn’t stop Phil for slicks immediately after the #24 pitted due to the drive time rules and this is when we lost the time as the track dried."